The comfort of your own living room combined with the experience of a full stadium. This idea of Miami Dolphins comes as latest temptation to richest fans out there. Expected to sell out before opening. While in Europe the approach towards corporate seats seems rather unified, in the NFL ‘good old’ skyboxes are more often being replaced by more innovative and original patents. 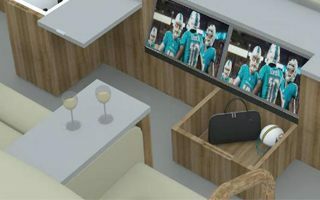 After Jacksonville Jaguars’ swimming pools now Miami Dolphins are offering the comfort of a living room within the stadium. So called “living room boxes” are sets of four armchairs offered to clients who don’t want to be confined to a small room. They’ll be placed openly within the stands, just like ordinary rows of seating. Except there’s nothing ordinary about them. Each foldable armchair will be 30 inches wide, nearly double the size of a regular seat. Set of four will also include a locked drawer to hide belongings in, waiting service and a litter bin, all packed together in a wooden finish. Basic set with an iPad to watch replays on will be worth $75,000 per year for four people. A large ’32 TV goes for $15,000 extra and four ’24 TVs for each viewer at $30,000. Altogether the set can be worth over $105,000 per year. Quite luxurious, but apparently adjusted to market demand. Dolphins president and CEO Tom Garfinkel. "There are enough people in this marketplace that, if you can do that, don't care what it costs." The new wide armchairs will occupy several significant sections in the stadium, most notably the southern stand’s 30-yard line on both sides of the field, both end zones and ground level – closest to the players. Using so many of them is the Dolphins’ way to recoup their $400 million private investment in the stadium. The club also assures that most regular fans will not be charged for the redevelopment project. Contrary to clubs using individual seat licenses, Dolphins aren’t introducing such solutions and the NFL side will freeze prices for 56% of seats. 17% will go up by less than $5 per game, which means the Florida-based franchise will remain one of the cheaper clubs to follow in American football. As part of the redevelopment works at Sun Life Stadium, the club will add a massive roof to existing stands. New rows will be created in the lower tier, bringing fans closer to the game. Meanwhile the corner sections of upper ring will be replaced with large videoboards.